I hope you have had a beautiful weekend. I am just getting back from vacation and am excited to share with you this amazing digital image by illustrator Sara Burrier. You can look at all her amazing images in the Crafts & Me online Store, their selection is amazing! The name of this image is "Hide and Seek". The detail in Sara's designs are pure magic. I have used Copic markers with a little Stickles added to the wings.The die used to cut her out was by Sizzix and I used the Triple Corner Punch by Stampin' Up! to make the coordinating mat. 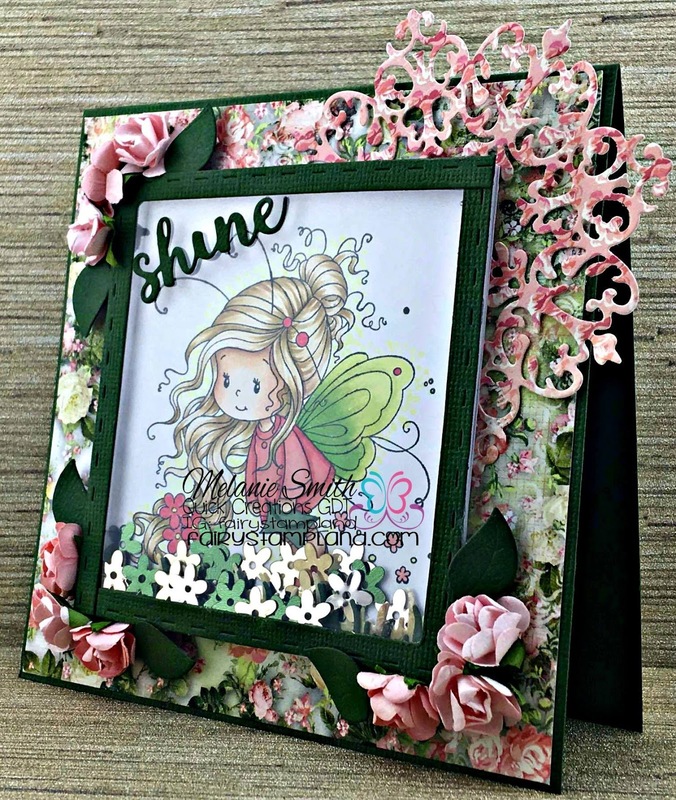 The sentiment is by Stampin' Up! and is punched out using the Word Window Punch also from SU! The flowers added are fussy cut from a matching designer paper and added with dimensional for extra dimension. 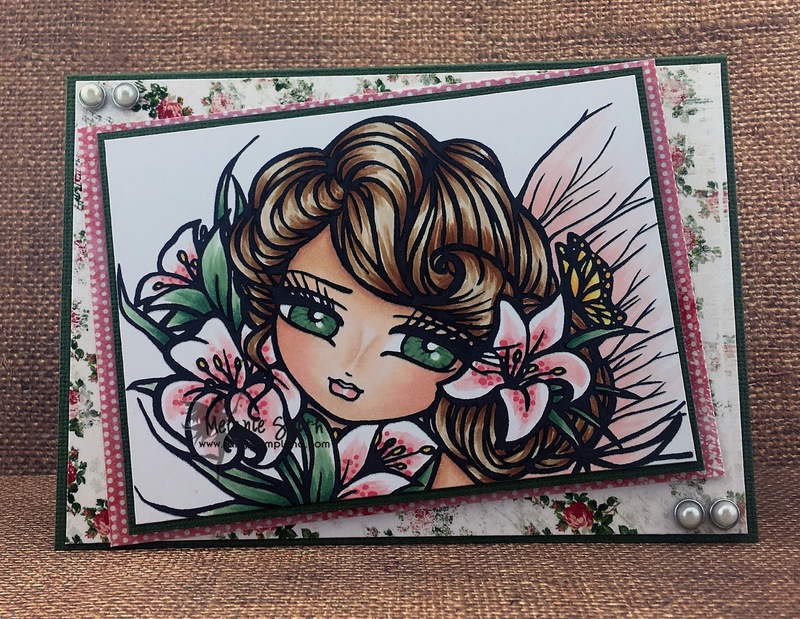 If you are interested in seeing more amazing designs head on over to the Crafts & Me Facebook page where we are kicking off a "Summer" challenge. Our challenges always include an "anything goes" option so they are stress free and fun for everyone. Today I am sharing my new Design Team card for Crafts & Me. This digital image is by Hannah Lynn and it is called "Easter Lily". I have colored her with my Copic Markers. I used this photo from the Longfield Gardens's Website. for inspiration. It is a Stargazer Lily. Here is a close up of my coloring. I love coloring Hannah Lynn's designs. To see all of them that we carry click on over to the Crafts & Me Store. Happy Mother's Day to all the mothers out there. I hope you are cherished by your family and that you have a beautiful day! 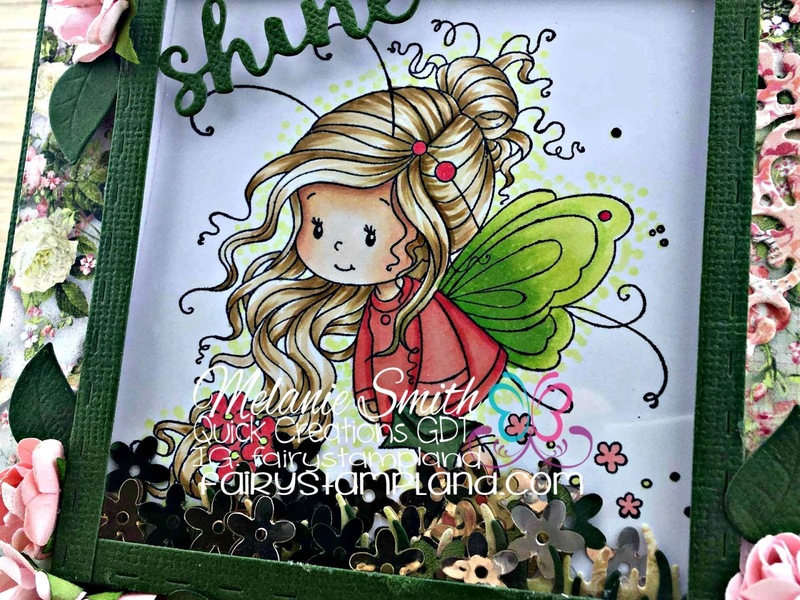 Quick Creations GDT ~ Wee Cindy! I am excited to announce that I will be guest designing for an amazing online store. Quick Creations has been one of my "go to" online resources for quite some time. They always have great prices and often times there are sales going on too, so make sure you check out their huge selection of items by clicking HERE. 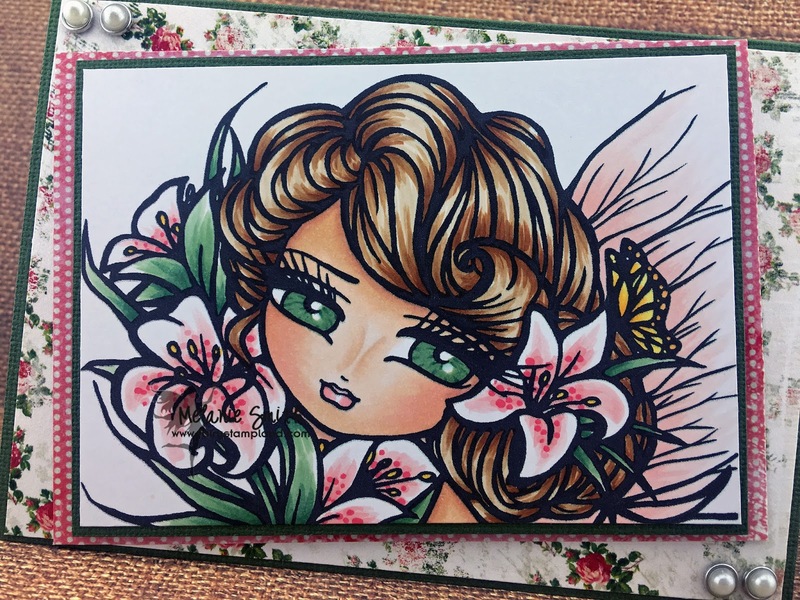 Today I am using a stamp by Whimsey Stamps called "Cindy" - everyone knows my love of fairies so of course I had to color a fairy since it is my debut GDT card for Quick Creations. I have used some beautiful Bo Bunny papers from the shop called "Soiree". These were such fun to work with and are so pretty!!! 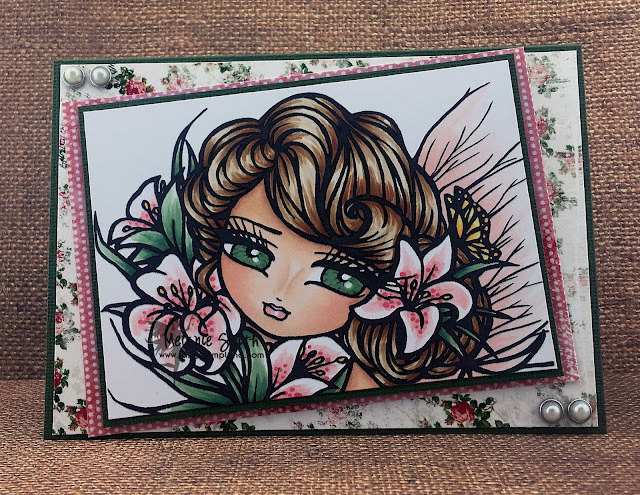 Check out all the beautiful dies I used in this card! I decided to make my very first shaker card because as soon as I saw the CC Designs Make a Card #13 Spring" Die set I had to have it. It comes with 14 different dies including the leaves, grass, as well as the stitched frame that I used for the shaker part. 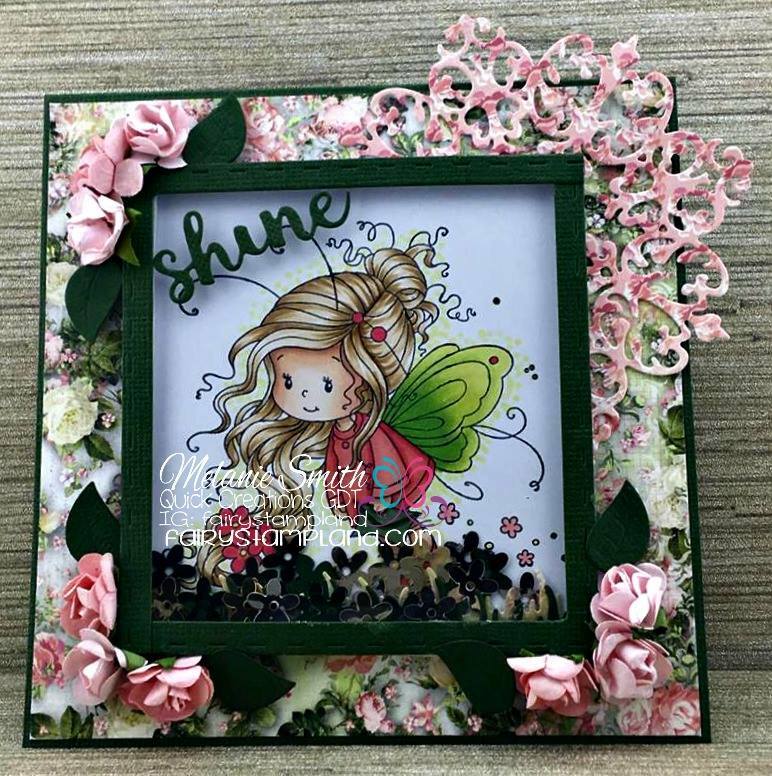 The beautiful Gilded Doily Die is by Little Darlings Rubber Stamps (LDRS Creative). Last but not least I used the Greeting Farm "Sparkle and Shine" word dies.... These are so perfect for card sentiments. I also used the "Fairy Floss" Mini Paper Blooms by Kaisercraft. They can be found HERE. Here is a close up of both my coloring as well as the shaker flowers inside the window. I colored Cindy with Copic markers. This was such fun designing and I look forward to many more GDT cards for Quick Creations. If you enjoy my work please consider "Following" me so you don't miss a post. I have numerous options for following my blog along the left side bar. Thank you so much for stopping by today.